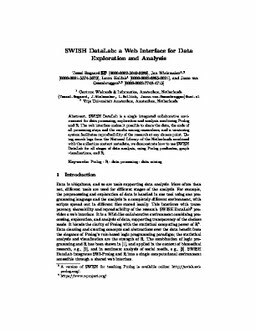 SWISH DataLab is a single integrated collaborative environment for data processing, exploration and analysis combining Prolog and R. The web interface makes it possible to share the data, the code of all processing steps and the results among researchers; and a versioning system facilitates reproducibility of the research at any chosen point. Using search logs from the National Library of the Netherlands combined with the collection content metadata, we demonstrate how to use SWISH DataLab for all stages of data analysis, using Prolog predicates, graph visualizations, and R.
Bogaard, T, Wielemaker, J, Hollink, L, & van Ossenbruggen, J.R. (2017). SWISH DataLab: A Web Interface for Data Exploration and Analysis. In BNAIC 2016: Artificial Intelligence.